Black oil sunflower seeds, striped sunflower seeds, white millet, peanuts and dried blueberries. Our new seed bells are a fun, decorative shape for attracting colorful birds to your backyard. Includes a built in hook for hanging. 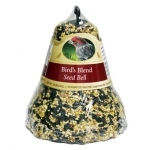 Pine Tree Farms' Seed Bells are a great way to attract more birds into your backyard. Seed Bells are packaged with colorful net that is ready to hang on trees and shrubs. Top quality peanuts, seed and grain are used to attract a large variety of wild birds. Bell-shaped cake of Chopped Peanuts, in ready to hang net. 16 oz. 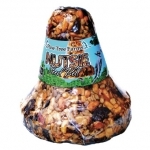 Nutsie No Waste Seed Bell is an 18oz bell of edible seeds and fruits, tree nuts sunflower hearts, pecans, dried fruit and gelatin. 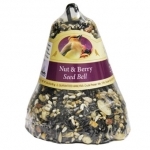 Each bell consists of the finest seeds and nuts to attract a variety of wild birds and it comes with its own hanger. The Nutsie Seed Bell seed has no hulls so that there is no mess. Virtually 100% edible with no waste. Keeps feeding areas clean and does not attract unwanted pests to your feeding station. A premium seed bar for the wild bird enthusiast.